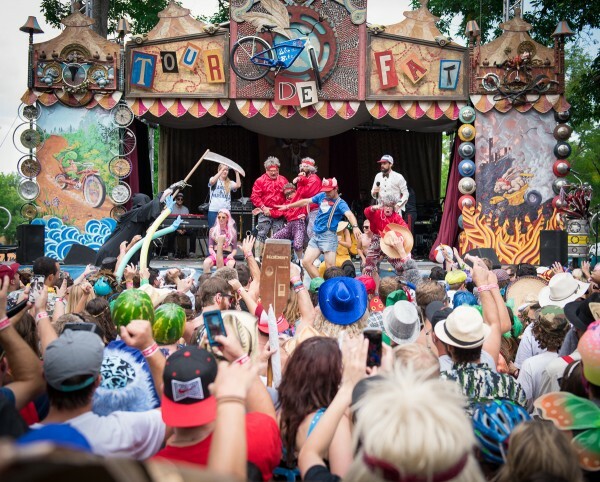 Fort Collins, Colo., Oct. 29, 2015 – New Belgium Brewing’s Tour de Fat, a traveling tour of bicycle advocacy and hilarity in charity, raised $647,668 for local nonprofits this season, totaling more than $4 million in its 16-year stretch. This year’s total is up more than $20,000 from last year. The event is free, but all proceeds from beer and merchandise sales and donations in each city go to local nonprofit organizations focused on making communities a better place to ride a bike. Tour de Fat celebrates bicycle culture, kicking off each festival with a costumed bike parade through city streets. After the parade, thousands gather for a day of eclectic entertainment, New Belgium beer, bike-themed festivities, live music, carnival variety tents and delicious local food trucks and more. At each stop, New Belgium works with local sustainability partners to divert waste from landfills, encouraging beer and bike fans to think twice about recycling. Tour de Fat traveled to 10 cities between May and October this year, attracting a total of 112,000 beer and bike enthusiasts. New Belgium’s hometown of Fort Collins had the most festival-goers, totaling 25,000 people and the Tour de Fat stop in Denver, Colo. raised the most money ($113,305). To see how each city performed, a breakdown is included below. Tour de Fat also hosted the ninth annual car-for-bike swap, where one brave role model in each city stepped on stage to trade in car keys and pledge to live car-free for one year. Each swapper received a $2,250 stipend to buy their own commuter bike in exchange for their car. Vehicles for Charity auctioned the swapped cars, with proceeds benefitting Tour De Fat’s local nonprofit partners. Each of the swappers is encouraged to blog about their adventures as a two-wheeled local rock star. To read their tales from the road, visit the car-for-bike trade blog at TradeMyCarForABike.Tumblr.com.